In our house Jane Austen’s books and the films and serialisations made from them were very popular when our girls were at home. We loved every version comparing heroes and heroines. My favourite has to be Sense and Sensibility with Kate Winslet and Emma Thompson. I love to look at the costumes and the embroidery on them. 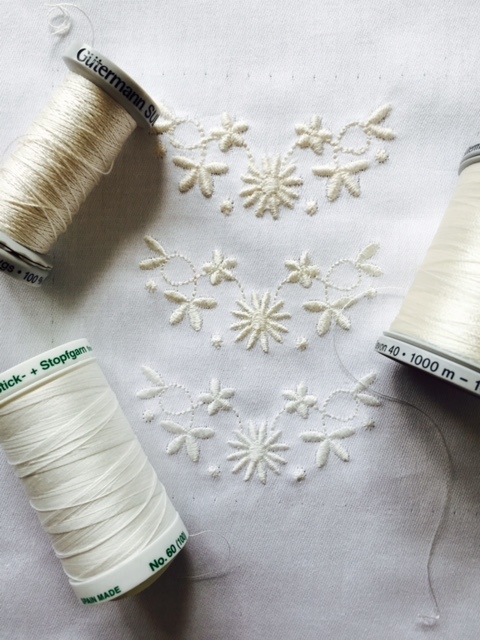 White work embroidery was very popular and Jane Austen was an excellent needle woman as well as being a celebrated author. 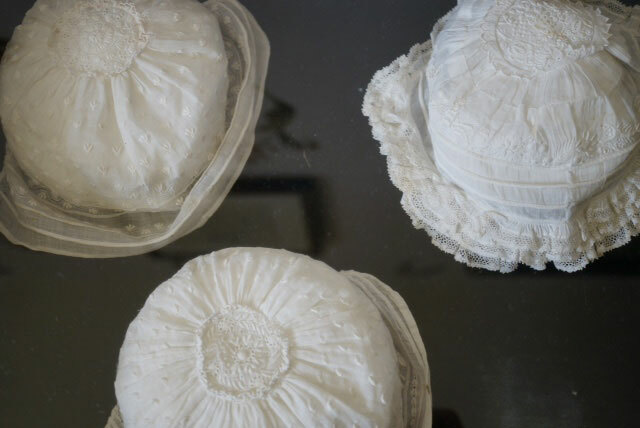 Several of my heirloom collections are named after characters in her novels but this new collection of white work I am currently working on, is named after Jane herself. The patience and dedication of these ladies in producing such beautiful embroidery is to be admired. I wonder if they had magnifying glasses to work by in the candle light. Now what would Jane think of our embroidery machines? I am in the very privileged position of living an hour or so from Chawton which was her home for a while. I have visited the house and museum several times. 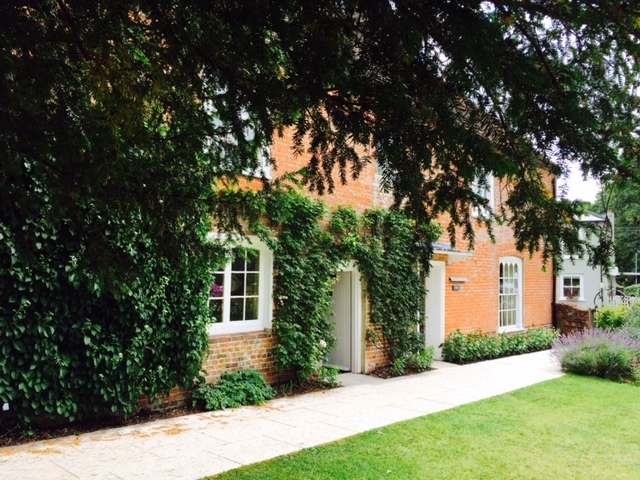 It is a little quiet oasis in the heart of rural Hampshire. A previous visit there inspired this collection as I was intrigued by the delicate embroidery displayed, so this morning I returned for a few hours to drink in the atmosphere and take a closer look at these delicately embroidered baby’s bonnets displayed there, as well as get a few last minute ideas to complete the collection. 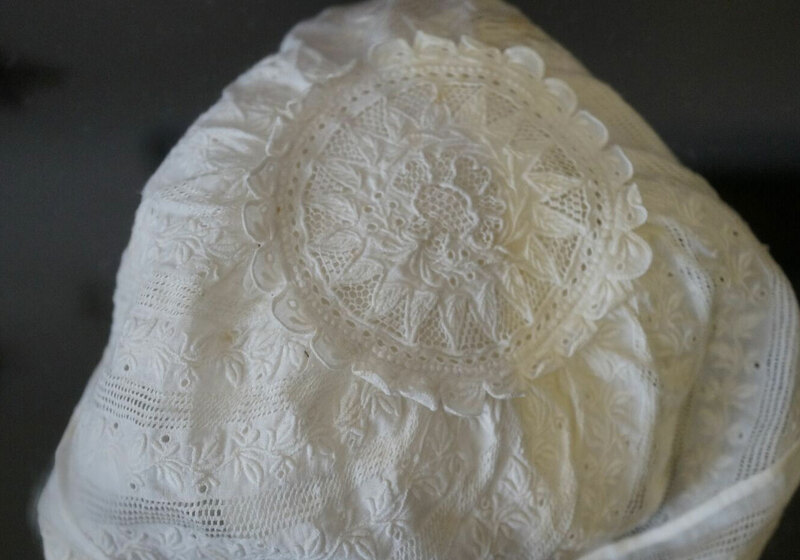 The intricate detail on these bonnets which the Austen family used is remarkable. NO 30wt cotton here. I think Jane would have used a finer thread for her work like Mettler 60wt cotton thread. More about that later. 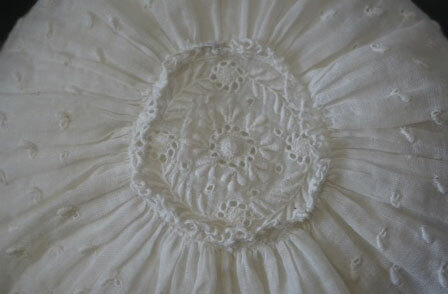 This bonnet has lovely little single petals with an eyelet at the end of each radiating out from the central disc. I love the rows of french knots and the leaf work on this bonnet. 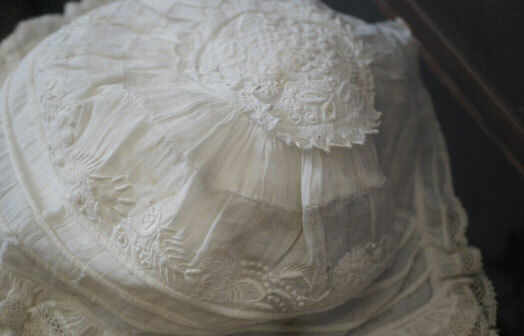 This is my favourite as there are delicate bands of what looks like drawn thread work and has what must be attached lace but I could not see the joins. I have been experimenting with several types of thread for this collection and after a great deal of testing I have decided to offer this collection for 3 types of thread. Here you can see the freebie which is already available to download. I have changed the density of the stitches to accommodate Sulky 30wt cotton, ordinary 40wt rayon or polyester and Mettler 60wt cotton. Initially the collection was to be digitised for 30 wt cotton but I love the results shown on the lower sample with the thinnest of the threads, the 60wt cotton. Do experiment with the huge variety of thread out there, and remember that manufacturers websites are full of invaluable advice and suggestions for use. When I used the 30wt cotton I found that is was best to slow my machine down and also turn off the automatic jump stitch cutter. I also got better results when I used bobbins that I had filled rather than the pre wound ones which I find have thinner thread and I used Schmetz 90/14 Top stitching needles. There is a larger size of needle but I was very aware of the holes a large needle would make preferring to let the embroidery take longer to stitch out by reducing its speed. Your bobbin area will need attention after using 30wt cotton too as it creates more fluff than rayon. This is my new iron steam generator! It is absolutely great (The Optimal care system means only one setting and no over heating or damaging the fabric with over zealous pressing with too a high a temperature!) and it even has graceful gold swirls on the body. Who would have thought an iron could be gold and pretty? 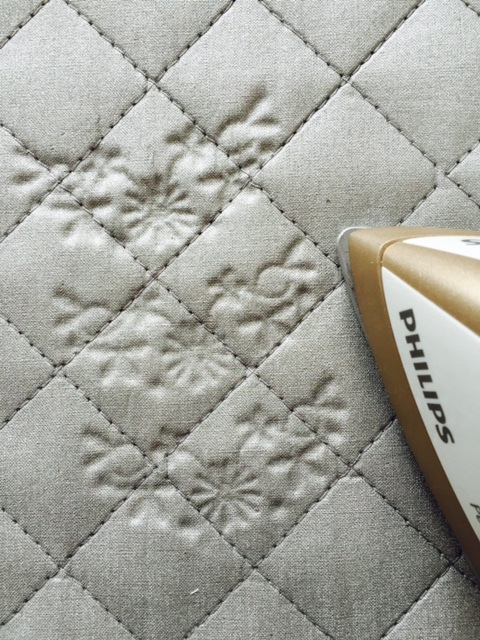 When I pressed the embroidery on the back I was impressed that it left such a great impression on my table top ironing area on my studio table. WOW! As always when I update my appliances I realise how “inefficient ” my old ones were. A good press is essential to set the stitches and reduce puckering. Before I left Chawton I took up paper and quill to create this work of art! Needlessly to say I got ink everywhere. Jane would not be impressed. I will stick with the digitising. The first set in the Jane’s White Work collection will be released this weekend. By the way there was so much inspiration at Chawton I have lots of ideas for a second white work collection which should be named after Jane’s sister Cassandra. However that may have to wait until later this year as it is almost time to do my Christmas digitising. 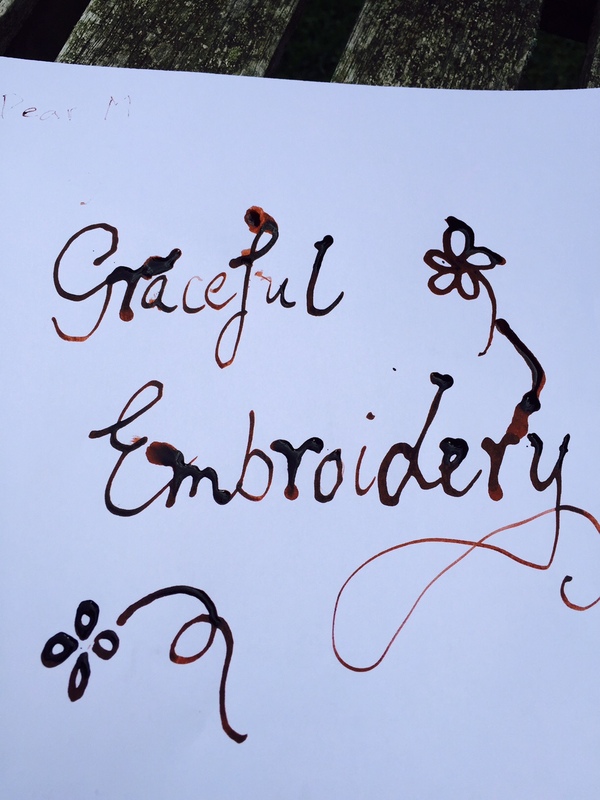 This entry was posted in Discussing machine embroidery, New Designs and tagged heirloom embroidery, machine embroidery, thread thicknesses, white work embroidery. Bookmark the permalink. What a lovely start to the day, Hazel. I too love visiting museums to se the wonderful achievements of the ladies who only had needle and thread! Your iron, I agree is wonderful, remember the irons that those poor women had? Heavy solid iron things ( the root of the modern name ‘iron’ which had to be heated on a range. They must have been tricky, if you were not to burn MONTHS of delicate work! I have a Rowenta, also with a gold base. It has a safety cut off in case I forget, & leave it on. A must as we get busier or older! Hazel, The Costume Museum in Bath has an large collection of whitework. If you request nicely in writing to explain you are doing textile research, they may let you in to their collection to study for several hours. For those of us who will never see the delights of Chawton, these photos are nothing short of enchanting. Now I understand why Hazel reaches into the past for the inspiration of her 21st century embroidery designs; like an unbroken thread through time. Perhaps I should post some of my other pictures about my day there!